2010 Housing Market, recovery or …… ? Aren’t you glad 2009 is over? So many foreclosures, 10% unemployment, so many houses underwater. 2010 has to be better right? Some realtors and economists are predicting better times for real estate in 2010. I really want to believe them. I really do. But what about the coming mortgage loan resets that will start about mid 2010? As many know we just went through a period of massive defaults on subprime loans. When housing prices stopped going up and people starting losing jobs, many of those loans became worthless. However we are still facing another period of possibly the same thing. 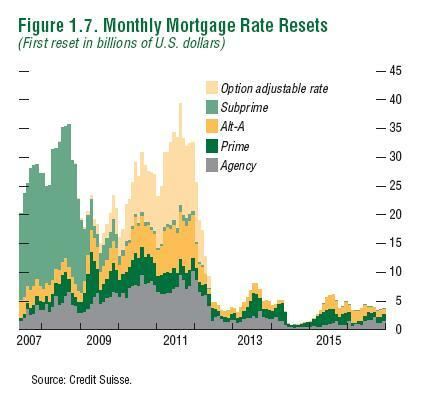 Many ARM (adjustable rate mortgages) are due to reset in 2010 with the peak in 2011. Here’s a picture from a report from the imf (international monetary fund). So far the banks have not been very accommodating to borrowers. Troubled borrowers have reported it is difficult to convert the temporary modifications from the government’s Housing programs to permanent programs. Only 9% of mortgages have been modified. And adjusting the principal value … which is what is really needed here .. forget it, they would rather foreclose. So unless the banks take proactive action with the this coming wave of Option ARM and Alt-A mortgage resets, housing isn’t out of the words yet. The new year, out with the old, in with the new! Many people are glad to see 2008 go. It was the year where a bad housing market turned into a freefall rout. Where many lost their jobs. So you can’t blame folks for having a lot of hope for a 2009 that is better than 2008. With the new year comes economic outlooks and predictions. I recently listened to an interview with Harry S. Dent, an economist known for accurately predicting the Japanese decade long recession, and the DOW hitting 10K, back in the 80s. According to Harry Dent, we are just in the beginnings of another great depression. While 2009 might see a short lived rally in the stock and housing market, overall we are in for several more bad years according to Dent. Harry Dent will be speaking at Wealth Summit Live, an event in Orlando on January 24th and 25th, featuring a number of well known speakers geared towards helping people succeed despite the dour economy. If you invest in real estate, I would recommend listening to the interview with Dent. Even if you don’t completely agree with him, his knowledge of trends and how they impact the economy is a message any investor should listen to. You can access the interview for no cost by registering at the Wealth Summit Live site. Maybe I will see you in Orlando! I must admit I’ve been far too busy to keep up with the media. But when I walked into a convenience store last Friday and saw this headline screaming up at me from a stack of San Francisco Chronicles I took note. Up to this point, the inner San Francisco Bay Area seems to had a teflon coating against the declining RE market. Yes the outer Bay Area is bad for a while, lots of foreclosures and huge price drops. My personal opinion is that the severe downturn in the outer bay has been hastened by the high cost of energy. Many in the outer Bay Area commute many more miles to get to places like San Francisco and Silicon Valley where the housing prices have always been higher. At some point the commute stops making sense. And let’s not even talk about further out into the central valley, where Stockton is ground zero for foreclosures, driven by speculation gone bust and really not much in the way of jobs. But the inner bay has been immune, or so I thought, severe building restrictions, an awesome climate, great culture and high paying jobs has always kept prices high and competition for houses intense. When I bought in 2000, I was incredibly lucky to be the one picked out of 14 offers. But the cancer of the housing market has spread inward and yes even San Francisco has suffered a double digit decline (11%). What’s dragging down prices? The large inventory of bargain priced bank owned properties. The individual owners don’t really have much of a chance unless they have something really special that the right person will want.